I was completely taken by surprise that writing yesterday’s tribute to my dad unleashed a torrent of grief within me. While it has been nine years since he died and I miss him everyday, I thought that the days of deep grieving marked by bouts of sobbing were over. Grief is a funny thing. One moment you can be doing just fine and the next you are plunged into the reality of your loss all over again and grief crashes into your day like ocean waves pounding over a sea wall during a storm. I experienced this truth twice since my dad died. The first thing I heard that last morning as I walked into my dad’s ICU room was Elton John singing “Daniel.” For some reason, the nurse had turned on the radio and it was playing softly in the backround. At that moment, I said to myself, “I never want to hear this song again.” I just knew that hearing that song would forever take me right back to that moment in time; a moment that I was wishing with all my heart was not happening. Two years later, I walked into a CVS store to pick up an anniversary card. Just as I got to the card aisle, “Daniel” came over the speakers…and I just froze. I wanted to run out of the store but I literally could not move and the tears just started to flow. The cards blurred before my eyes and while I was physically standing in that aisle, my mind had taken me right back to that room in the ICU. Once the song ended, I dried my tears, purchased my card, and walked back into the Florida sunshine, reminded afresh that I was a daughter without an earthly father. The second time this happened was just two months ago. I was enjoying a date with my husband and we had been having a wonderful day, full of laughter and good conversation. We decided to get some lunch and had just been seated at the restaurant when “Daniel” began to play over the loudspeakers. Right before my husband’s eyes, his wife, who had just a second ago been laughing, suddenly dissolved into tears and was overwhelmed with the pain of searing loss. I have learned that when grief makes a sudden and surprising appearance that it is okay. It is a sign of how strongly and fully we loved. It is important to let the tears flow, feel the loss, remember the joys. But above all, allow Hope to reign. After my dad died, I had to find an outfit for his funeral, so I went to the mall by myself one afternoon. It was early December and the mall was festively decorated. Happy Christmas music was streaming through the sound system and everywhere I looked people were smiling and laughing. It was almost more than I could bear. It felt cruel that there was all this merriment surrounding me while my heart was broken. After purchasing an outfit, I walked to my car and with each step, my anger grew. I resented the fact that the Christmas season was in full swing with all its brightness…while my life now seemed covered in a heavy blanket of gray…dull and colorless. I got into the car and slammed my door shut, angry tears beginning to spill as I poured out my heart to Jesus. His tender voice was unmistakable but the message confused me. Right there, in a crowded parking lot in Bethel Park, Pennsylvania, the radiant colors of Joy returned to my life. As a Christian, I do not grieve without hope (I Thessalonians 4:13-14). Because Jesus came to this earth, lived a perfect life, paid the penalty for my sin on the cross, died, and rose again, death is not the end…it is only the beginning of eternity. My dad knew Jesus as his Savior and as a result, the moment he left this earth, he was ushered into the presence of Christ. He is more alive now than he ever was. I will see him again…all because Jesus came! Our relationship has not ended…it has only been interrupted. My dad was HOME. His earthly journey was complete. He was face to face with his risen Savior and he now “knows God in that deep, personal union, that utter euphoria of experiencing Him.” –Joni Eareckson Tada, When God Weeps. Our hope as Christians is not wishful thinking…our Hope is the very Person of Jesus Christ and the reality of His resurrection. Therefore, that hope is “a sure and steadfast anchor of the soul” (Hebrews 6:19)..even (especially) when our hearts are breaking. So yes, the tears will come and grief will still break into our days at the most unexpected of times. However, we do not have to stay in that place of grief; we do not have to settle down there. There is always Hope, no matter how deep the pain…because Jesus came. 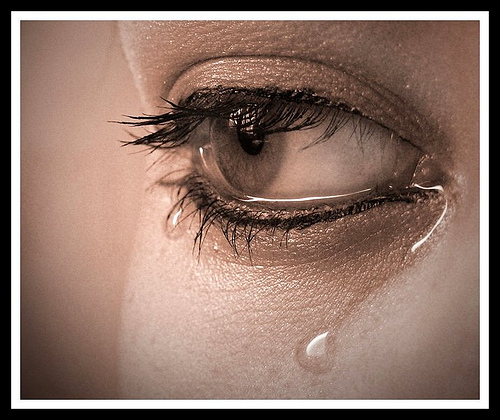 “There is a sacredness in tears. They are not the mark of weakness but of power. They speak more eloquently than ten thousand tongues. They are the messengers of overwhelming grief…and unspeakable love.”–Washington Irving.